Swami Vishnudevananda Saraswati was born into a pious brahmin family in Calcutta, India on holy Makara Sankranti day, 14 January 1904. He lost his parents in youth and grew up with relatives in the villages of Bengal. With an inner knowing that something lay beyond his meager life, he renounced the material world at the age of nineteen and traveled throughout India in the company a Tantric adept in search of the ultimate Truth. During the 1930 Kumbha Mela at Prayag, Allahabad, he met his guru, the great saint Yogiraj Handiya Baba. Under his spiritual guidance he practiced Vedanta, Hatha Yoga and Raja Yoga fervently and realized the Supreme Truth in 1934. An illumined yogi, Guruji lived his long life enjoying inner peace and spiritual bliss at his ashram, the Yoga-Vedanta Kutir, at Prayag (Allahabad), where he trained his monastic disciples and shared his experience and wisdom with his many devotees and students. In 1960 he began learning English on his own and authored more that ten books. He made his first voyage to America in 1978 and visited there annually during the summer months. 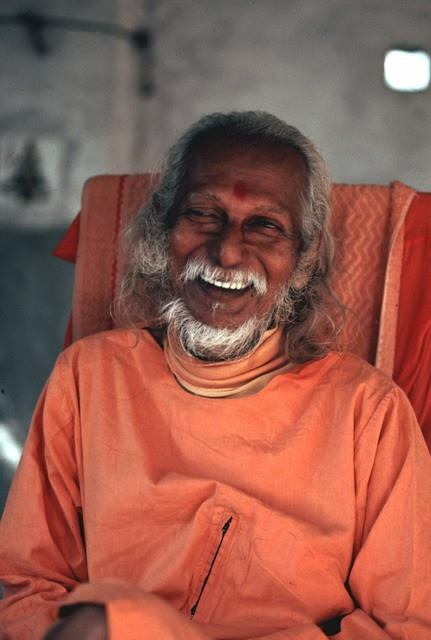 Guruji left his mortal body in 1997, leaving his holy ashram to his dear disciple and servant Swami Omananda. Guruji’s saintly character, ideal life and divine teachings continue to inspire and guide his disciples and grand-disciples worldwide. Click the links below to view PDF versions of Swami Vishnudevananda's writings. Our heartfelt gratitude to Brahmachari Tejasananda Chaitanya for making this material accessible through his archival work at http://www.goddessdevotion.com/lineage-tradition/swami-vishnudevanand-saraswati-of-prayag/ .